Yes ! Vivement la suite ! This project ended successfully on 26/4/2015 18:00! You will receive a download code of the upcoming album. You will receive 1 signed CD of the upcoming album. You will receive 1 signed vinyl of the upcoming album (download code included). 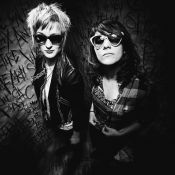 The Chikitas are a bundle of energy ready to burst.Their songs speak for themselves: The single «LaLaLaLa», from their second Album DISTORIS CLITORTION (2014) will beat the living daylights out of any listener. From Geneva and more than ready to go long, the duo rock band will present their very own version of Rock. The only question is: Can you handle The Chikitas?